Today’s announcement is part of a succession plan carefully developed over several years with the leadership of the company. As part of the transition, Kalin Samson joined the company as Chief Financial Officer, and Scott Fowler will take on the role of Vice President for the company’s Loretto operations. Anthony Godlewski, who as Vice President currently oversees the company’s Waite Park operations, will remain in that role; and Elliot Christensen will continue to serve as Shingobee’s Director of Business Development. Nancy Samson has been with Shingobee Builders for 14 years, and served as the CFO and Corporate Secretary/Treasurer. 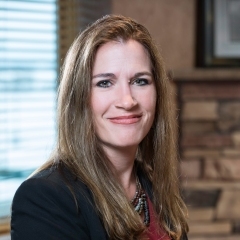 She brings a strong management and financial accounting background, combined with experience in the commercial construction industry, to Shingobee’s management team. Nancy graduated from St. Cloud State University where she received her B.S. degree in Accounting, then went on to achieve her Certified Public Accountant (CPA) license in 1998. She has 24 years of experience in a variety of industries, with 20 of those years in the construction industry. She is currently a board member of Associated Builders and Contractors Minnesota chapter, where she is active on the Legislative Committee. Since assuming the sole ownership of Shingobee Builders, Samson will be pursuing certification as a woman-owned business enterprise for the company. Kalin Samson joined Shingobee to fill the role of CFO and Corporate Secretary/Treasurer in June. He brings a strong management and financial accounting background to the leadership team with his 24 years of experience. Kalin graduated from St. Cloud State University where he received his B.S. degree in Accounting, then went on to achieve his Certified Public Accountant (CPA) license in 1996, and Master of Business Administration (MBA) in 2001. Scott Fowler joined Shingobee in 2017 as a Senior Project Manager. With 24 years of experience in the industry, Scott has managed a wide range of diverse projects and held several positions, including Field Engineer, Project Manager, Senior Project Manager, and Operations Manager. He leads major construction projects at Shingobee and acts as a mentor to other project managers. Scott holds a B.S. in Construction Engineering from the University of Nebraska, certification in Lean Building from Associated General Contractors, and International Building Council certification. Anthony Godlewski has been a Senior Project Manager for Shingobee for over 25 years, and is currently Vice President overseeing Shingobee’s Waite Park office. He holds a B.S. in Business Administration, Construction Management emphasis, from Mankato State University. As Director of Business Development for Shingobee Builders, Elliot Christensen coordinates the efforts of many individuals. Elliot has 20 years of experience in the industry and facilitates regular communication between Shingobee management, customers, and project teams to ensure they have the resources necessary to accomplish their goals and create an enjoyable experience.